The CES event is done, and quite frankly, this year saw some amazing new launches , and gave us glimpse as to how far technology has come, and how much more is left to be explored. One of the companies who stood out, was none other than ASUS, and this time, it was their smartphone launches that grabbed attention. ASUS has been rather silent in the smartphone market, with success coming in bursts. This time though, it seems they spent a lot of time on the drawing board, and delivered two devices , which if marketed properly, could take this company a long way in the smartphone market. Out of the two, the one I am more interested in taking a deeper look at is the Zenfone 2. One look at the device and it will instantly remind you of the LG G3. The similar button layout, slim side bezels, make it look like the G3’s fraternal twin. The difference is that this device will cost you only $200, and also offer you a range of interesting colors to choose from. Usually, a low price will immediately lead us to think that it is just another cheap knock off, and probably features only the usual run of the mill specs. This Phone however, is here to change that thought forever. Connectivity – Its no surprise to see the Zenfone 2 feature 2G, 3G and 4G connectivity. We also get the dual Sim functionality. Good start for a $200 flagship. Display – The Zenfone 2 features a 5.5 inch 1080p Full HD Display, with a pixel density of 403 ppi. The display is Crisp and couple that with Gorilla Glass 3 Protection, and you are left staring at a display package which can stand up to almost any flagship in the market right now. This is truly turning out to be miles apart from the first Zenfone. 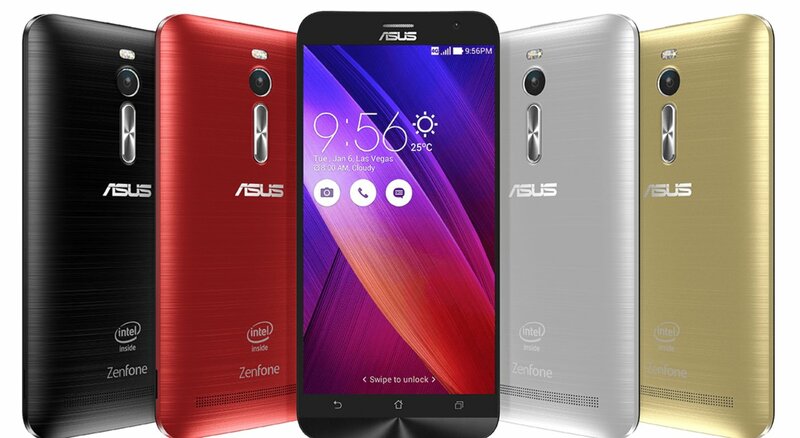 Processor and OS – The Zenfone 2 will boot Android 5.0 Lollipop out of box. This is good news as people , even now are waiting for the OTA update to hit their devices. The Zenfone 2 owners will be covered in that aspect. As for the chipset, Asus has gone for the Intel Atom chipset, and that too in two variants. We have one variant which will feature the Atom Z3580 Chipset, and the other with the Atom Z3560 chipset. Memory – This is where the Zenfone 2 will show you why its not just another run of the mill smartphone for the masses. The device comes in three variants, that is 16/ 32/ 64 GB internal memory with two RAM options. We get the standard 2 GB RAM variant, and a staggering 4GB RAM variant. To top it off, we can also expand the memory via SD card upto 64 GB. This memory package, will draw in the performance junkies in the thousands, as no one would drop off a 4GB RAM option. Camera – The Zenfone 2 features a 13 MP rear camera with dual LED flash. A 5 MP front snapper rounds up the camera package. Asus has included manual camera controls , and the overall layout resembles the G3 in many ways, but thats alright. As long as the camera performs to its best , the layout won’t really matter. Battery -The Zenfone 2 packs a solid 3000 mAh battery, which will give you a day’s worth of use on a single charge. You could stretch the use to a day and a half or even two if you are one the conservative users. All in all, the Zenfone 2 is a phone which gives you top notch features for half the price you would pay for another competitor phone with the same features. Asus looks like they finally want to challenge the top spot , and with Samsung going through a Loss and Apple in a world of their own, the underdongs will do everything in their might to grab that elite top spot. Wehen the Zenfone released, it looked like a rather limp attempt by Asus, but that is no longer the case as Asus has decided to put the past behind them, and come out swinging. So, anytime you are looking for a flagship, but can’t really put in a solid investment, this Phone will definitely fit the bill.